Two men.Two very different futures. The problem? She’s falling for both of them. For Chelsea McCormick, living in Cedar Springs is supposed to be temporary, nothing more than a chance to slow life down so that she can sort out the chaos of her life. Period. But when two very different men vie for her attention, Chelsea finds her beliefs challenged in ways she never thought possible. Scott Harding has always loved the small town life. Settling down in a place with a sense of community, like Cedar Springs, then falling in love and starting a family is Scott’s idea of perfection. And Chelsea McCormick is just the woman who makes everything he’s ever wanted, seem possible. Driven and ambitious, Lucas Lee sees his time in town as temporary, merely a launching pad to catapult him into a more prestigious position. He’s never been interested in a serious relationship, but Chelsea just might be special enough to change his mind forever. Chelsea knows it’s time to move on, but things in Cedar Springs have just started to get interesting with two available and seriously gorgeous men vying for her attention. The problem is…they both represent two very different futures and Chelsea is drawn to both of them. Love, adoration and a future? Or, excitement, passion and the unknown? One man appeals to who she wants to be, and one to who she realizes she’s always been. How can she possibly choose? 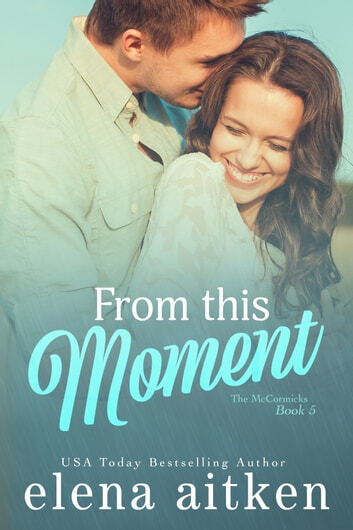 From This Moment is the fifth in the McCormicks Series that readers call, "really touching, funny, sweet and gut-wrenching all mixed together." By USA Today Bestselling Author, Elena Aitken! Like all my books, From This Moment can be read and enjoyed as a stand-alone novel. But be sure to catch up with all your favorite characters with the rest of the McCormicks for more small town romance! I've read all The McCormacks books but this can be read as a standalone although much better when you know the rest. Chelsea is adorable and has been through a lot and just struggling to find her path in life. The single one whilst all her siblings have been finding love around her. Then all of a sudden Chelsea finds herself in the midst of a love triangle with 2 very different guys.....who will win her heart? An enjoyable read along the way to see which guy steals her heart. I hope we find out more about Chelsea's journeys in the future. Wonderful, wonderful story! Elena never disappoints me....all her writing is great. As usual, I am looking forward to her next. Sweet read. This is a nice easy read, would be a great vacation book. One of those margaritas on the beach reads, under a nice large umbrella. There is a small amount of intrigue, a large amount of romance and a HEA ending. Well worth the time spent. A sweet and heartwarming story of love. From This Moment(The McCormicks book 5) by Elena Aitken Elena Aitken never ceases to amaze me. I love her writing style. I love the emotion she puts into her stories. Her stories are always so heartwarming. In From This Moment we finally get Chelsea's story. Chelsea McCormick never intended to stay as long as she has in Cedar Springs. We get to see how Chelsea has really matured from the first book to this book. In From This Moment you get a lot of things wrapped into one book. You get heart swoon worthy moments as well as some angst, issues and a bit of drama. It's a beautifully written story about a woman discovering herself on her journey of life and love. You get to watch Chelsea as she chooses between Scott and Lucas. Elena Aitken knows how to write. I love all her books. I really enjoy small town romances and she really can write them. She has a writing style I love. I really enjoyed reading From This Moment. I cried, laughed and felt my heart swoon. There was a few unexpected twists and turns but that just made the book more enjoyable. There was nothing that I didn't enjoy about this book. I recommend this book to anyone who loves romance and small town romances.